International interest in SolaRoad is growing. We are in advanced talks with the US State of California and its road authority while the SolaRoad Kit that is being applied in Groningen has attracted interest in France. “Climate is big business”. The Dutch government and the State of California could not be more in agreement. This was evident during the climate mission at the end of May led by Secretary of State for Infrastructure and the Environment, Sharon Dijksma, in which SolaRoad featured. The Member of Parliament cited SolaRoad explicitly in her speech as an example of Dutch innovation that is helping to achieve climate targets. The enthusiasm on the side of the authorities in the world’s sixth biggest economy remains substantial. In talks with environment minister Matt Rodriguez and the Caltrans road authority we discussed the progress of the intended pilot in Kern County north of Los Angeles where the idea is to equip a hundred-metre strip of road at a parking lot with our technology. SolaRoad fits in seamlessly with the ambition of Caltrans to generate solar energy from the road infrastructure. A foothold in California, a state that is a global leader when it comes to sustainability, represents a major step forward in getting SolaRoad into the market. But it’s not confined to the US. A French party has also expressed interest and has ordered a number of samples of the SolaRoad Kit. This ready-made product comprises four elements of 2.5 x 3.5 metres and is suitable for cycle or walking paths, a square, a yard or a business park. The kit generates around 3,500 kWh annually, which is comparable to what a household consumes in a year. The electricity that is produced can be used for purposes like street lighting, traffic lights and charging points. 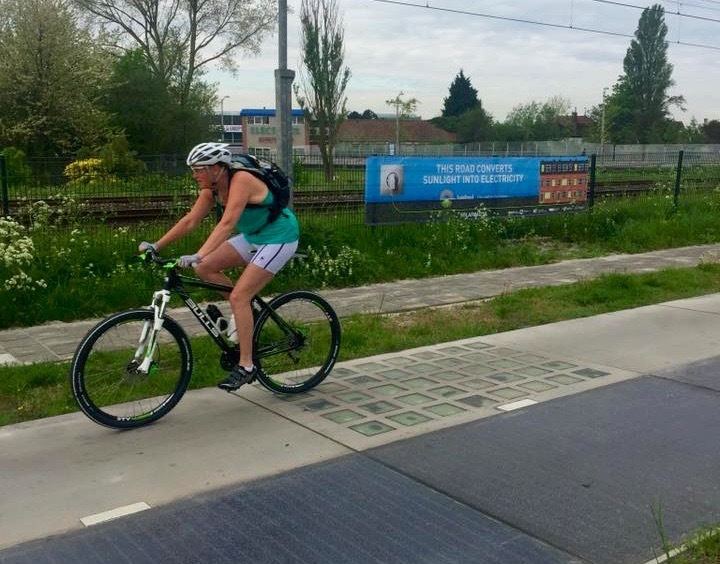 Groningen was the first user: in mid June the Blauwestad district began using the ‘STOPcontact’ smart loader powered by the SolaRoad Kit road surface that enables cyclists or walkers to ‘top up’ their tablet, phone or bike. To extend the lead our country has in solar road surfaces, the TKI Urban Energy project PV4Roads has begun. This project involves TNO, Strukton Civiel, Vlaq Groep, Heliox, Kameleon Solar, EV Consult and grid operator Alliander cooperating to develop the next generation of solar energy producing roads. It will deliver prototypes for highways that we will be testing in practice in 2018.